Plastic materials are extensively used in the medical devices sector. The applications of plastic injection-molding range from surgical, drug delivery, self-treatment, geriatric care, diagnostic testing, preventative medicine, and so on. Recently, the development of plastic application in prosthetic device and invasive surgical instruments has gained a lot of attention due to its cost-effectiveness and antiseptic qualities. As a result of delicacy and defect-free requirements for medical devices, quality control is the key for manufacture procedure. Moreover, due to the small part size, a number of medical devices are manufactured in multi-cavity injection-molding to boost productivity. It is crucial to have all cavities fill evenly to ensure uniform products quality and high yield rate. Traditionally, a trial-and-error technique is applied to test and validate design, but it results in extending product manufacturing cycle time and high production costs. Besides, many medical devices are composed of fabricated components. For effortless fabrication, warpage of each molded part must be controlled precisely. To overcome all the design issues within time and cost limitations is a huge challenge for the medical-device sector. Moldex3D professional CAE simulation software can be utilized in various product development stages. During the pre-development stage, the mold has not yet been made, and engineers can use the simulation tool to validate their designs such as weld line locations and potential short shot. Besides detecting problems beforehand, Moldex3D can help validate and enhance the design. Users can use the simulation tool to compare several different designs such as number of gates, runner system, and cooling system layouts by producing iterated simulation run to attain the optimized design without wasting money and time on trial-and-error experimental approaches. Moldex3D provides simulation for Fill, Cool, Pack, and Warpage, a comprehensive simulation solution for injection-molding manufacture process of medical products. Moldex3D aims to integrate value to each company by presenting problems and solutions, adding to reduced time-to-market, and top product standard. Multiple cavities product is the most extensive application of plastic product in the medical sector. In multi-cavity molding, achieving an even and balanced flow of material to each cavity is a repeated challenge. Imbalance could still take place in a geometrically-balanced runner design because of the viscous heating effect, and therefore, ways to enhance the runner system will be a huge problem in this topic. Multiple cavities product: Moldex3D molding simulation helps users to foresee the uneven flow and short shot issues beforehand. Users can adjust the runner layout by looking at the simulation results, and then the product quality would be made better by enhancing the manufacturing process. For molding analysis, Moldex3D uses true 3D runner mesh. As a result of the boundary which is one of the most crucial areas for computation during the injection molding process, Moldex3D designs boundary layer mesh (BLM) to attain more accurate simulation results. Since healthcare is an extremely regulated industry, precise and effective quality control is vital and indispensable to guarantee product quality and to uphold its high standard. How to make top quality products within cost and time limitations has raised the significant challenge for New Deantronics. Moldex3D is capable of accurately predicting the behavior of melt front. Runner and gate system design can be modified, and melt filling in thick section is allowed before contacting the thin section. This can remove problems of melt temperature drop and flow hesitation because of uneven thickness, thereby ensuring smooth and uniform filling in the cavity. Moreover, Moldex3D offers a complete fluid-structure interaction analysis for users and plays a key role in the production of these products. 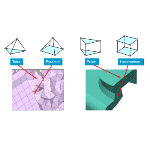 This information has been sourced, reviewed and adapted from materials provided by Moldex3D. For more information on this source, please visit Moldex3D.